Pigging pipeline processes vary depending on the type of product carried in the pipeline, and the size and materials of which it is constituted. Pipe pigs are used for a range of purposes, including natural gas and liquid pipelines. These devices are forced through the pipelines using pressure. 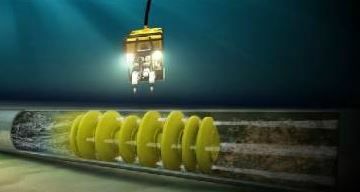 Most often, pipeline pigging devices have steel bodies equipped with plastic or rubber seals that scrape against the inside walls of the pipeline. Scrapers and brushes can also be attached to the body of the device to scrub the pipe walls clean from the inside during pigging pipeline procedures. Pipe pigs have two main functions; firstly, helping to ensure that any potentially damaging substances are removed from the pipeline to ensure continuous operation, and secondly, helping to maximize the efficiency of the pipeline by removing any debris in the pipeline to prevent buildup that restricts flow. When pipe pigs were first put into use, their main function was to remove large wax or dirt deposits in order to ensure proper flow. Today, pipe pigs are required during each phase of the life of a pipeline. Foam pigs can be used for pigging pipelines. Spheres and foam pigs can be used to fill lines during hydrostatic testing, followed by dewatering it after hydrostatic testing, and for drying and purging operations. Brush pigs and scraper pigs are used to periodically remove water, dirt and wax from pipelines. Spheres are used to sweep liquids out of gas pipelines. Go-Devil and squeegee pigs are used to separate different products in the same pipeline, thus reducing the amount of mixing that occurs. Foam pigs and spheres can be used to control liquids in pipelines, including two-phase pipelines. Caliper pigs and intelligent pigs are used to inspect pipelines for corrosion, buckles and dents. Both spheres and pigs travel at approximately the same velocity as the liquid in the pipeline. During a pigging pipeline procedure, a launcher is used upstream, and a receiver downstream. Sphere launchers are generally designed for multiple launching and recovery duties, featuring longer barrels that allow operators to load several spheres into the magazines for automatic launch. Senior operations staff typically supervise pig launching and receiving procedures, as safety procedures must be adhered to at all times, and they may have to facilitate a variety of troubleshooting efforts. Drinkwater Products supplies a wide range of Pipeline Pigs, including Foam, Cast-Urethane, Steel Body, Spheres, Gauge Pigs, Solubles Enduro Pipeline Services. Pipeline Pig Brands: Girard Industries, Knapp Polly Pig, Maloney Technical Products, S.U.N. Engineering, T.D. Williamson. sizable inventory to ensure clients find the ideal pipe pigs. When you need to buy pipe pig or other pipeline maintenance solutions, Drinkwater Products makes it easier by offering a wide range of options online. Specialist pipeline pigging products can be hard to come by, which is why our customers choose to buy pipe pigs online. Drinkwater Products is known throughout the US for offering an unmatched selection of the highest quality pipeline products available as well as providing unparalleled support and expertise to guide customers in selecting the right product for their specific application.